Use the principles of Applied Behavior Analysis in this groundbreaking curriculum to teach the Common Core state standards in special education classrooms. Available in Kindergarten and First Grade, the ABA Curriculum for the Common Core drills down into each standard and breaks it into teachable steps. This week, SAVE 15% on the ABA Curriculum for the Common Core books for Kindergarten and First Grade. Use promo code KINDERFIRST when you check-out online or over the phone: (800) 853-1057. Programs are presented in a format that supports data collection and ease of use. Clear teaching instructions detail the Teaching Procedure, Discriminative Stimulus, and the Materials needed for each lesson or activity. Each standard also list several targets that demonstrate the steps and goalposts needed for mastery. Don’t forget to use our promo code KINDERFIRST to redeem your savings this week only on the ABA Curriculum for the Common Core books! *Offer expires at 11:59pm EST on February 23, 2016. Promotion does not apply to past purchases. Be sure there are no spaces or dashes in your code KINDERFIRST at checkout! Call our friendly customer service team at (800) 853-1057 with any inquiries. Following up on our ground-breaking Kindergarten kit for the ABA Curriculum for the Common Core, we’re thrilled to introduce the long-awaited ABA Curriculum for the Common Core: 1st Grade. This week, we’re also offering 15% off the normal retail price – just enter our promo code 1STGRADE at checkout to redeem your savings! Utilizing the same accessible format, this new curriculum rooted in Applied Behavior Analysis addresses each and every Common Core State Standard for 1st grade students. Created by Sam Blanco, MSEd, BCBA, this curriculum has been devised exclusively for students in special education settings using the evidence-based principles of Applied Behavior Analysis (ABA). In addition, comprehensive Data Sheets are included in the curriculum guide, along with samples of how to complete them. The goal of this curriculum kit is to make the Common Core standards accessible and relevant to students with autism and special needs. Don’t forget to redeem your savings this week on the brand-new ABA Curriculum for the Common Core Kit: 1st Grade. Just mention or enter our promo code 1STGRADE when you check out with us online or over the phone! We’re thrilled to introduce this pioneering curriculum kit containing both the materials and programs to teach each Kindergarten Common Core standard for both English Language Arts and Math. Authored by Sam Blanco, MSEd, BCBA, the curriculum has been created exclusively for students in special education settings using the evidence-based principles of Applied Behavior Analysis (ABA). We’re offering this robust curriculum kit for a limited-time introductory price of $499.95. Completely unique, this kit contains a curriculum book that drills down into each standard and breaks it into teachable steps. Programs are presented in a format that supports data collection and ease of use. Each Common Core standard is presented on its own page with clear instructions detailing the Teaching Procedure, Discriminative Stimulus (Sd), and Materials required for teaching. Each standard lists several targets that demonstrate the component steps and skills required for mastery. 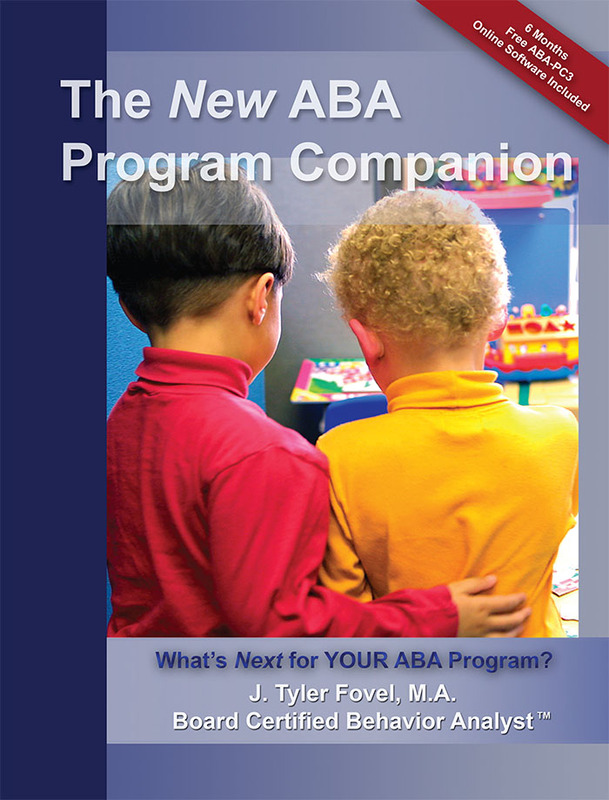 A thorough “how-to” guide presents the main tenets of ABA, giving staff an accessible understanding of Motivation and Reinforcement, Pairing, Prompting, Generalization, Natural Environment Teaching, Preference Assessment, and Data Collection. In addition, comprehensive Data Sheets are included, along with samples of how to complete them. Our ABA Curriculum for the Common Core Kit comes with more than 24 quality, versatile manipulatives, flashcards, games and tools. The curriculum book explicitly explains how to use these materials to teach and generalize each standard. The materials included in the kit have been carefully selected to not only assess and teach each standard and prerequisite skill, but also be wonderful additions to any classroom setting. The materials can be used during more intensive group and one-to-one instruction, as well as during center time and independent play. The goal of this curriculum kit is to make the Common Core standards accessible and relevant to students with autism and special needs. Additionally, by breaking each standard down and drilling into the prerequisite skills, the opportunity exists to use these Kindergarten programs for older students who are not developmentally able to meet grade-level standards. By equipping teachers with teachable steps for each and every standard and pairing the teaching with motivating, versatile materials, the ABA Curriculum for the Common Core Kit puts Kindergarten students in Special Education on the path to achieving success. You can also purchase today the Curriculum Book separately for only $64.95 $59.95. This curriculum book is best utilized in conjunction with our ABA Curriculum for the Common Core Kit: Kindergarten and explicitly explains how to use the materials presented in the kit to teach and generalize each standard. Soft Cover, 176 pages, by Sam Blanco, MSEd, BCBA. Special educators and consultants are already finding this to be an invaluable resource in the classroom.